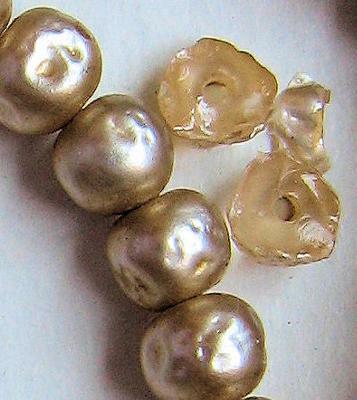 I doubt these pearls are real but they are baffling as I can't find any information about them. Since they are wrinkled I think they might be freshwater but after trying all the tests I cut one open and it appears to be glass with a coating. They seem heavy for the size of the strand which consists of about 200 pearls of approximately 4mm each and are champagne bronze in color.